Come celebrate our 70th Anniversary with us at Kelly’s Resort! 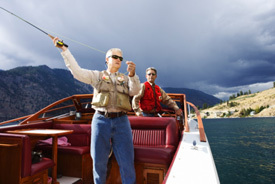 Kelly’s Resort is a small family resort situated approximately 12 miles up the South Shore on beautiful Lake Chelan. We have 200′ of waterfront with four docks, a beach area and enclosed lake fed swimming. We have a main lodge on waters edge with a small store and a coffee shop that is open from Memorial Day to Labor Day. Additionally we have four lakeside condos directly on the water. On our hillside we have 11 individual cottages as well as a heated pool that is open from Memorial Day through September. We have laundry facilities as well as a play ground and nature trails. All of our cottages and condos are equipped with full kitchens, dining, living, bedroom & bathrooms as well as private decks with gas bbq’s.